Holm Olaf Bursum, a Senator from New Mexico was born at Fort Dodge, Webster County, Iowa, on February 10, 1867. He attended the public schools. He moved to New Mexico in 1881, settled near Socorro, Socorro County, and engaged in stock raising. He was a of member of Territorial Senate from 1899-1900; chairman of the Territorial central committee in 1905 and 1911; member of the State constitutional convention in 1910; member of the Republican National Committee 1920-1924; appointed on March 11, 1921, and subsequently elected on September 20, 1921, as a Republican to the United States Senate to fill the vacancy caused by the resignation of Albert B. 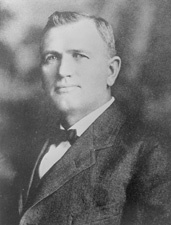 Fall and served from March 11, 1921, to March 3, 1925; unsuccessful candidate for reelection in 1924; chairman, Committee on Pensions (Sixty-seventh and Sixty-eighth Congresses) engaged in the newspaper business at Washington, D.C. He subsequently returned to Socorro and resumed his former business interests until his death in Colorado Springs, Colorado on August 7, 1953. He is interred at Socorro Protestant Cemetery in Socorro. Moorman, Donald R. “A Political Biography of Holm O. Bursum, 1899-1924.” Ph.D. dissertation, University of New Mexico, 1962; Fernlund, Kevin J. “Senator Holm O. Bursom and the Mexican Ring, 1921-1924.” New Mexico Historical Review 66 (October 1991): 433-53.